NuFlow St. Louis proudly offers advanced sewer inspection technology to help our valued customers in Belleville, IL. We can ensure accurate repair diagnoses, check for early warning signs of a problem, help avoid sewer main accidents during renovations, and ensure that you pass your city building inspections with our powerful visual inspection system. 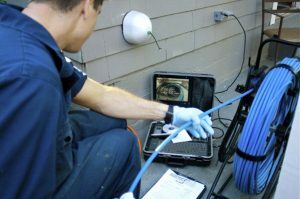 To complete your sewer inspection, NuFlow St. Louis inserts a waterproof HD camera that’s custom-designed to survive in the wet and dirty interior of a sewer system while still collecting high-quality video footage that aids in sewer maintenance and repair. The camera has its own light source that illuminates the pitch-black surroundings, revealing every detail in perfect clarity. The camera instantly feeds this footage through a flexible, fiber optic cable to a viewscreen where our trained and experienced technician evaluates it for signs of a problem. Our technology makes it possible for real-time visual inspection of the sewer system from the inside, even while they’re still buried deep below the surface. Sewer inspection is an important part of home or business maintenance that can save you thousands of dollars in costly repairs through early detection. The symptoms of sewer problems are usually the result of harm that’s already occurring, so relying on wet areas, odors, and drain problems to diagnose a sewer issue means that you’re not catching the problem until the damage has already begun. Sewer inspection identifies weakened or leaking sewer lines before they become serious enough to injure your property, protecting your home or business from costly damage. NuFlow St. Louis’ sewer inspection services are also an important part of the process during a sewer repair. Our camera systems allow accurate diagnosis of a sewer issue, eliminating the danger of a false diagnosis and preventing unnecessary costs. It also speeds along the repair process for faster results and helps develop more precise repair plans that completely fix the problem without any excess work. Sewer inspection is an integral part of our trenchless methods, guiding the tools and materials so that repairs can be completing in areas where direct exposure isn’t possible. Another important use for our sewer camera inspection service is pre-construction sewer mapping. Nearly everyone has heard of a household or business renovation project where the contractors accidentally struck a sewer main that was buried in an unexpected place. Sewer mapping can not only identify the horizontal locations of the pipes in the property, but also provide information on the depth at which they’re buried, eliminating the worry of a sewer disaster during a home addition or business expansion. NuFlow St. Louis can even be a part of your new structure building process by providing sewer pre-inspection services to check your new installation prior to scheduling the city inspector. Our technicians are fully versed in current Belleville, Illinois code requirements and can verify that your sewer main meets the specifications. Rather than failing a city inspection and waiting for the next available appointment, you can pass your sewer inspection the first time because you already know it’s right.